The pharmaceutical industry and the American Medical Association (AMA) are running scared – very scared. In fact, jackrabbits have more courage right now than they do. After having created a near-monopoly in medical care that has endured one hundred years since the Flexner Report came out in 1910 with its hatchet job against competitive health treatments such as homeopathy, naturopathy, osteopathy, chiropractic, and herbal medicine, this drug and medical mafia has kept a jealous and vigilant watch over its monopolistic commercial privileges. These privileges, mind you, would not and could not exist without the very active participation of government enforcers who ensure that any serious competitors will be regulated out of existence or into insignificance. And if, by chance, any of these competitors should pose a serious threat to the medical mafia, then heavy fines, incarceration, and public humiliation will be their fate. Yet, despite government thugs' relentless and best efforts to suppress these challenges to the medical monopoly, we have all seen a phenomenal growth in alternative healthcare and throughout the dietary-supplement business, proving once again that government is hopelessly incompetent at waging war against anything, whether it's the War on Cancer, the War on Drugs, the War on Terror, or, yes, the War on True Healthcare. That the medical mafia is truly scared can be seen in its scooping up large chunks of the supplement business, some of them made into "Pharma Lite" companies that will not threaten drug-industry profits but instead simply silently support the status-quo medical system that sees hundreds of thousands of Americans and Canadians die each and every year. Their fear can also be seen in their repeated – and now stepped up – media campaign to demonize supplements and alternative medicine. From the April 2010 Reader's Digest cover story screaming "The Vitamin Scam" to the equally biased USA Today front-page story by Liz Szabo (June 19, 2013) on the dangers of alternative medicine, the push is on once again to convince consumers everywhere that supplements and alternative medicine are dangers to be avoided at all costs. Conspicuously absent from any such "exposés," though, is any comparison of the health risks between highly regulated drugs and doctors, on the one hand, and "loosely regulated" supplements and alternative healthcare, on the other. All except the naïve know that supplements and alternative healthcare are not even in the same league as deadly conventional medicine. Enter the medical mafia's latest boy wonder talking head – Dr. Paul Offit, or should we say "Dr. Profit"? Looking as if he were sent straight out of Central Casting, Dr. Offit has put his name on a book that I would bet was actually written, or at least heavily researched, by a medical-mafia marketing team and given the cutesy title "Do You Believe in Magic? The Sense and Nonsense of Alternative Medicine." Presumably, Dr. Offit would know the answer to that question, as he himself has proved to be a fervent believer in the magic of over-vaccinating children as well as the magic of drugging Americans at every opportunity despite a yearly body count that would make ancient despots proud. Remember, Ibuprofen alone kills some 17,000 Americans a year. And how many thousands of Americans are killed annually by vitamin-and-mineral supplements? A big, fat zero. 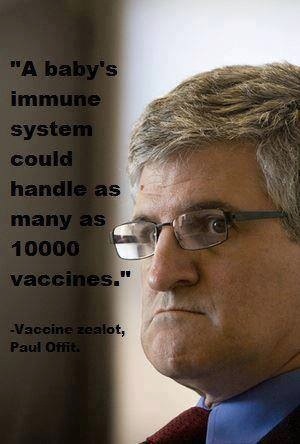 So, if anyone believes in magic, it is the pathetic talking head Dr. Offit. Still, in a back-handed compliment to the National Health Federation that recognizes its importance, Dr. Offit's hatchet job begins with an attack on the Federation, claiming it "represents the financial interests of the alternative-medicine industry" and even had a hand in the death of a child whose parents were led astray from conventional medicine. Serious, but false, accusations – which ignore, once again, the hundreds of thousands of deaths every year at the hands of properly licensed doctors and hospitals and because of FDA-approved drugs. It is also predictable that Dr. Profit, who most assuredly represents the financial interests of the drug industry, should try to tar the Federation with the same familiar brush that tars him. Even if true, which they are not, Offit's claims are nothing more than those of a Drug Lord complaining to the police or public that someone had trespassed across a corner of his property. Back in the 1960s and 1970s, the AMA similarly unintentionally complimented the Federation by spying on its conventions. The medical mafia guards its monopoly jealously. The Offits of the World come and go. Next year's drug peddler might still be Offit or it might very well be someone else, someone fresh and unexposed for what he or she really is – nothing but a slick talking head for the drug industry. But, in the meantime, how many deaths, lessened quality of life, shortened lifespans, and lives filled with pain, misery and tears will be on Offit's hands because he scared consumers and patients away from healthful supplements and into unnecessary surgeries, harmful vaccines, and killer drugs? Offit's soulless repetition of drug-industry platitudes will convince the unthinking and naïve; but in doing so, they carry very real consequences for many millions of lives. Is this not also another form of the "banality of evil" of which Hannah Arendt once wrote? David Stouder, a health-food store owner in Redwood City, California and radio personality, coined the term "Nutriphobia" in describing a condition where otherwise sensible people think that drugs are safe and nutritional supplements are dangerous. As he puts it, "Nutriphobia is not a joke. It causes untold misery and poor health and even leads to fatalities. It is rarely diagnosed before considerable damage has been done and is commonly spread by doctors to their patients. Nutriphobia can cause a person to turn away from natural substances (vitamins, minerals, herbs, amino acids, phytonutrients, etc.) that can truly build and maintain health. Nutriphobia enhances the illusion that consuming synthetic pharmaceuticals (which, when prescribed and taken properly, kill well over 100,000 Americans each year) is the 'scientific' way to good health." Dr. Offit clearly suffers from Nutriphobia; and, unfortunately, the condition is highly contagious. Some, such as well-known health researcher and writer Bill Sardi, have methodically deconstructed Offit's specious arguments against supplements and alternative healthcare. (See "Why the Latest Study On Vitamin Supplements May Not Be Instructive To You" by Bill Sardi, at http://knowledgeofhealth.com/why-latest-study-on-vitamin-supplements-may-not-be-instructive-to-you/) Marc Brush, in his short but well-done article "Supplements in the Crosshairs, Again," solicits comments from several industry and other leaders in response to Offit. (See http://newhope360.com/supplements/supplements-crosshairs-again) These, and more, are all worth reading so as to inoculate oneself against Nutriphobia, a contagion every bit as dangerous as many diseases. Dr. Offit may be a well-credentialed and degreed professional; but, seriously, Offit knows less about nutrition than most of the individuals reading this article. His degrees and credentials might impress, but the parchment upon which they are printed are nothing more than certificates of ignorance. In a hundred years, if not sooner, Offit will be forgotten, except to those social and medical historians studying the follies of an obsolescent and fading 21st-Century health industry, who, I suspect, will easily hold Offit up to the same ridicule and disdain as Stalin's Lysenko is today. Clearly, Offit suffers from the nutriphobic condition defined by Mr. Stouder; but Offit is also a symptom – a symptom of the fear that pervades today's Disease-Care industry. Fear of alternative medicine and supplements, fear of change, fear of loss of market share – ultimately fear of you and me. That failing industry will resort, as it has for a hundred years, to employing the tools of government coercion and media disinformation to persuade its customers to remain enslaved by a never-ending cycle of disease and ill-health until death. John F. Kennedy's warning that "a nation that is afraid to let its people judge the truth and falsehood in an open market is a nation that is afraid of its people" must be heeded. That fear illuminates our strengths. We need merely to continue pressing resolutely forward, confident in the genuine science supporting our various ways of maintaining health and forestalling disease. We must not delude ourselves that we somehow have all of the answers or that we ourselves are flawless. No system is perfect; we can only hope to minimize the imperfections and failures. And through the free flow of truthful health information, absent from government coercion and suppression, we can minimize the deaths and ill health that so badly plague our current outmoded system of disease care that pretends to be healthcare. Scott Tips, JD is a California-licensed attorney, legal columnist and president and general counselor for the National Health Federation. He specializes in food-and-drug law and trademark law, but also engages in business litigation, general business law, and nonprofit organizations, with an international clientele. Listed below are links to blogs that reference this entry: Do You Believe in Offit?. This page contains a single entry by Toni published on July 10, 2013 12:00 PM. Supreme Court rules Drug Companies exempt from Lawsuits was the previous entry in this blog. Hepatitis B vaccine caused chronic fatigue syndrome – US Court is the next entry in this blog.